Loyal customers who trust and recommend a company’s product and services is one of the key building blocks of any business. Their recommendations and reviews are a testament to the company’s consistency, innovations, and quality. Surviveware, leading camping and outdoor adventure company, has grown its market niche by consistently providing customers with better options for outdoor and preparedness gear. Over the years, the company has developed high-quality gear tailored to the unique needs of its target market. The growing popularity of the company among hikers, campers, survivalists, and hunters is proof that more and more people are patronizing their products. Surviveware’s loyal customers express their satisfaction in purchasing Surviveware’s latest innovational product, the Large First Aid Kit. This 3.3-pound life-saving kit contains 200 medical supplies that can address both minor and major injuries. Packed in resealable laminate bags inside of a 600D Polyester bag, all of the items are secured from water and moisture. The kit has a MOLLE compatible system making it convenient to be strapped and carried anywhere. It can be attached to a headrest, a rucksack, a tent, or placed inside kitchen drawers and cabinets. The large first aid kit also comes with a mini kit filled with supplies that can be attached to a belt or backpack. With these features and proven track record, this kit is a must-have for any preparedness situation. Another Surviveware customer, Moxie, highlighted in his review the essential features of the expanded first aid kit and how well this large first aid kit fits his needs: “I bought (and still use) a smaller First Aid kit by Surviveware last year, and I have been impressed with the quality and contents of the kit and their customer service. I was recently looking for a larger kit that would be suitable for a broad range of situations but still be compact enough to travel with. Working at sea, I can be away from land for days or weeks at a time, and I don't like to chance that whatever boat I am on has a well-stocked first aid kit. I feel much better traveling with my own. In my free time I like to be in the mountains and, again, I feel much more comfortable traveling with a good sized first aid kit. I shopped around when looking for this larger kit and went with Surviveware again because of the quality of the previous product, comprehensive contents, value for money and customer service. Having received the kit I am impressed with how well thought out it is. The bag is separated into compartments, each labeled with the type of contents (wound closures, eye pads, gloves, wound dressing, etc.). Each section of the bag is accessible, and no items are hidden - very important in an emergency. The bag itself feels like it will last a lifetime and it has some different attachment points/methods so that it can be stored or carried conveniently. I like the strap used to mount to the back of a car seat (the manufacturer has a picture of this). It allows the bag to be unzipped and fully open with all the contents still accessible while still attached to the seat. 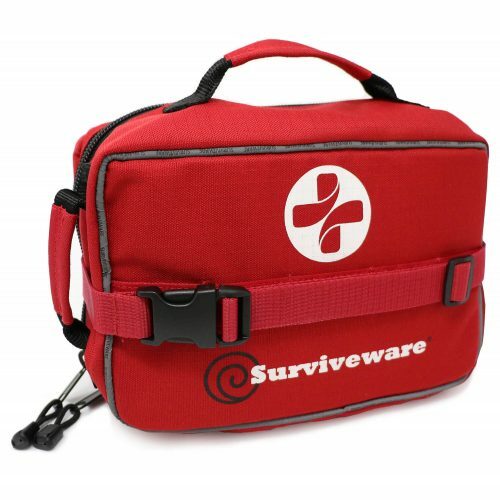 To thank their customers, Surviveware is giving away 20% discount coupons to the first 100 buyers of their Large First Aid Kit. Take advantage of this limited time offer and buy your first aid kit now! Click here to get your coupon today.